We are so excited to share Megan and Ben's magical wedding day. We were so honored they chose us to be their wedding DJ for their wedding celebration right here in Greenville, SC. They also chose to hold their big day at one of our favorite wedding venues, The Old Cigar Warehouse on Main Street. The wedding team was then made even more awesome with the addition of one of our favorite wedding planners, Kelley with Clink! Events. To put the cherry on top, they chose our good friend Jenny Williams to be their wedding photographer. We have worked with Jenny a solid handful of times over the last couple of year and we absolutely LOVE her wedding pictures! As the saying goes, "Team work makes the dream work", and their awesome wedding was a pleasure to DJ. Special thanks to this talented group of wedding pros! Their squad was awesome! What a great group of friends! This map is a great way to help your guests find their way around Greenville, downtown, and even the venue. Megan and Ben entering in for their Grand Introduction. This is where we set the tone for the entire night for our couples’ weddings. The Old Cigar Warehouse provides one of the most beautiful spaces for first dance pictures. Megan and Ben’s first dance was no exception. Kelley with Clink! Events is one of our all time favorite wedding planners in Greenville, SC. Megan and Ben enjoying some delicious cake from Couture Cakes. Susan is extremely talented at wedding cake design. She can really do anything with a cake! What Clemson wedding is complete without an appearance from the Clemson Tiger, himself. We love incorporating mascots into the wedding dance party. Packing dance floors…it’s our thing! Megan and Ben had such a fun wedding DJ with Chris. Cheers to Megan and Ben! 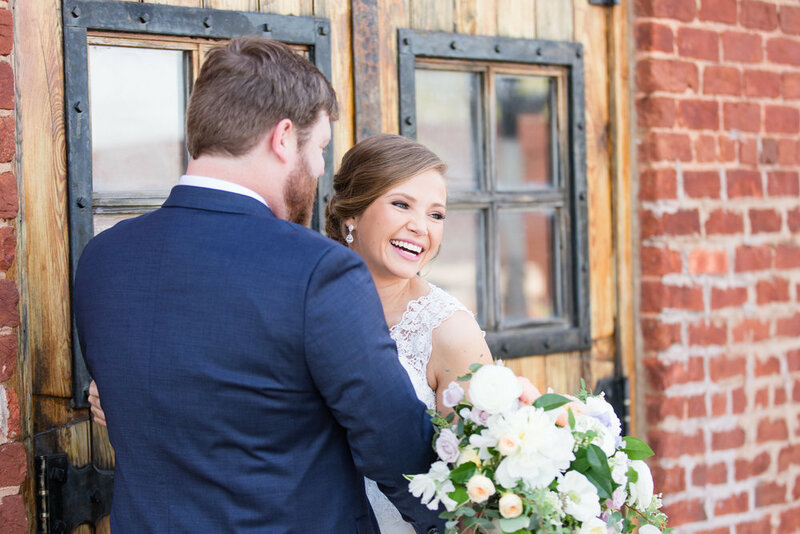 To say that Meredith and Brandon's wedding at The Gassaway Mansion was a stunning celebration is an understatement. Let's just say, we had a beautiful day, a gorgeous venue, an awesome bride and groom, and even a dinosaur! Yes, a dinosaur!!! Their wedding day was perfect from beginning to end, not to mention that they are one of the sweetest couples ever. Their wedding day was full of everything we love. An extremely touching wedding reception, plenty of family and friends, many touching moments during the formal reception, and yes, an epic dance party. Katie with Cotton Rouge always does the best job! Meredith and her bridal squad got ready at Embassy Suites in Greenville. The Gassaway Mansion looked AMAZING and we were blown away by how great it looked! The house makes quite the wedding backdrop! Meredith and Brandon's romantic first dance. A little lovin' in Daisy May! Upon meeting with Nicole and John, I could tell that wedding entertainment was at the top of their list. We are always honored when someone is looking for the best wedding DJ in Greenville, SC to fit their needs. They had already teamed up with some folks we love to work with and we too started planning for their wedding. Fast forward to their wedding day. Their reception was held in the Poinsett Room at The Westin Poinsett in downtown Greenville. We not only provided the DJ aspect of entertainment, but we also had our open-air photo booth on site (see the photobooth pics here), as well as our beautiful uplighting to round out their gorgeous venue. As you can see in the pictures, their wedding day was full of beautiful moments and a TON of fun, which takes me to their wedding celebration. Simply put, it was a BLAST! Packed dance floor, smiles all around, and a bride and groom having the time of their lives. Every great wedding has a great team behind it. Check out all of the vendors that Nicole and John chose for their wedding day below. Furman's campus always provides an incredible backdrop for wedding day pictures. LOVE this epic shot with the Bell Tower in the background at Furman University! Our uplighting adds a very elegant touch to the ballrooms at The Westin Poinsett. Nicole and John had practiced and showed our with their choreographed first dance! Greenville, SC provides so much scenery for great wedding pictures. Great job Josh! The newlyweds having a ball in our open-air photobooth. The wedding planner, Crystal Williams, getting their exit #lit ! Who does not love a beautiful, sunny October day in South Carolina?! Carina & Ray got the perfect weather for their wedding at the Westin Poinsett in downtown Greenville. They gave us the opportunity to provide their playlist for ceremony as well reception. Prior to ceremony Davey Morgan with Davey Morgan Photography took Carina & Ray down to Falls Park to capture the couple in some of Greenville’s iconic locations. The Westin’s Gold Ballroom was the location for ceremony & reception. While guests were at cocktail hour on the Mezzanine, the Westin’s staff flipped the space to reception. Carina & Ray asked Uptown to provide uplighting for the room to really help differentiate the reception from the ceremony. Carina & Ray chose the song “Time After Time” by Rod Stewart for their first dance. Another iconic location in Greenville is the Westin’s Rooftop sign. If you get married at the Westin, you are allowed to take pictures in front of the sign on your wedding night! Their amazing group of family & friends stay on the dance floor all night! We worked with an awesome group for their wedding. We couldn't have done it without all of you.